Painting and love are like sisters; they are very different, of course, but are tightly connected and related in many ways. The familiarity of post-medium discourses today has, curiously, set the scene for painting’s resurgence as an art form. Despite its gendered and discriminatory history, painting remains valorized in contemporary art, and it is used towards powerful feminist ends. Certain understandings of painting today might even be incognizable within traditional definitions, as the medium looks or works more like sculpture, performance, or pure network formation. At the moment of capitalism’s digitization, its material obsessions are far from diminished. Isabelle Graw maps the forceful paradoxes driving painting’s continuous critical and commercial allure in her landmark new publication, The Love of Painting. Genealogy of a Success Medium (Sternberg Press, 2018). Graw keeps a close eye on painting’s fourteenth century theoretical foundations, developing a distinct genealogy of the medium’s dazzling vitality in the present. Interwoven among the volume’s essays are dialogues with numerous artists whose work Graw examines, as she considers the critic’s networked position and complicates her interpretative strategies. In a public discussion marking the book's US launch, she outlines some of her major arguments, inviting responses from David Joselit, Distinguished Professor of Art History at The Graduate Center, CUNY, and New York-based painter Avery Singer. 5 ½ x 7 ⅞ inches / 14 x 20 cm 364 pages, color ill.
Isabelle Graw is Professor for Art Theory and Art History at Staatliche Hochschule für Bildende Künste (Städelschule), Frankfurt am Main, where she co-founded the Institute of Art Criticism. She is an art critic, and co-founder of Texte zur Kunst in Berlin. She is author of Die Bessere Hälfte. Künstlerinnen des 20. Und 21. Jahrhunderts (DuMont Verlag, 2003), High Price. Art Between The Market and Celebrity Culture (Sternberg Press, 2009), Texte zur Kunst. 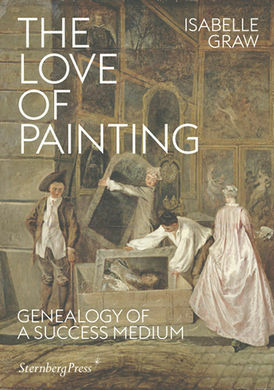 Essays, Rezensionen, Gespräche (Philo Fine Arts, 2010) and The Love of Painting. Genealogy of a Success Medium (Sternberg Press, 2018). David Joselit is a Distinguished Professor of Art History at The Graduate Center, CUNY. He is author of Infinite Regress: Marcel Duchamp 1910–1941 (MIT Press, 1998), American Art Since 1945 (Thames and Hudson, World of Art Series, 2003), Feedback: Television Against Democracy (MIT Press, 2007), and After Art (Princeton University Press, 2012). He is an editor of the journal OCTOBER and a frequent contributor to Artforum. Avery Singer was born in 1987 in New York, where she continues to live and work. She studied at Cooper Union, New York; the Staatliche Hochschule für Bildende Künste, Städelschule in Frankfurt am Main; and the Skowhegan School of Painting and Sculpture in Maine. Recent solo exhibitions include: Sailor, Vienna Secession, 2016, and Kölnischer Kunstverein, 2017; Scenes, Stedelijk Museum, Amsterdam, 2016; Hammer Projects: Avery Singer, Hammer Museum, Los Angeles, 2016; and Pictures Punish Words, Kunsthalle Zürich, 2014, and the Fondazione Sandretto Re Rebaudengo, Turin, 2015).